Each RuneScape quest consists of several linked tasks within a common story-line. Some RuneScape quests take minutes, others – hours and even days. By completing different quests the player gets various rewards – experience, items, access to new areas, minigames or miniquests. In 2018 the number of RuneScape quests reached a total of 220 quests — 35 free and 185 members-only. 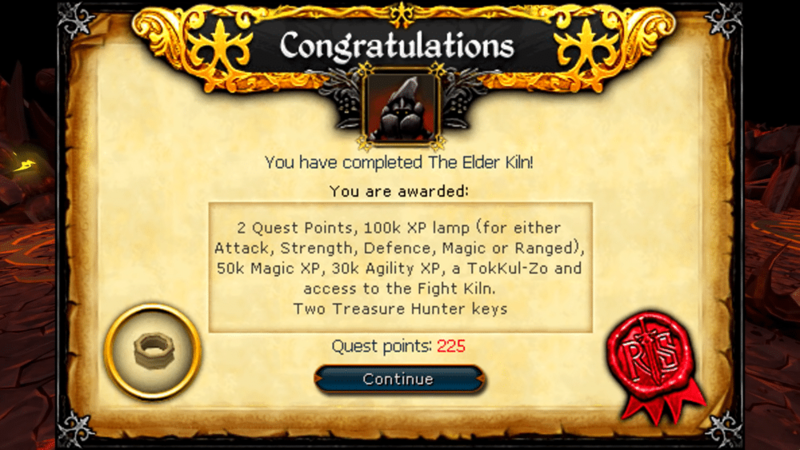 Completing the Elder Kiln quest the RuneScape player is awarded 3 quest points; 100K XP lamp for attack, strength, defence, magic or ranget; 50K magic XP; 30K agility XP; Tokkul-Zo; access to Fight Kiln; 2 Treasure Hunter keys. Quest points: 225. On completing the Temple at Senntisten quest the RuneScape player account gets 2 quest points; 23K XP lamp; 2 20K combat XP lamps; 10K player XP lamp; access to Senntisten Temple altar; access to ancient curses; 2 Treasure Hunter keys. Quest points: 282. When the player completes the Plague’s End quest his RuneScape account gets 2 quest points; 50K XP agility lamp; 50K XP crafting lamp; 50K XP construction lamp; 50K XP dungeonering lamp; 50K XP herblore lamp; 50K XP mining lamp; 50K XP prayer lamp; 50K XP ranged lamp; 50K XP summoning lamp; 50K XP woodcutting lamp; Of The Elves title; Trahaearn exoskeleton; access to Prifddinas; 2 Treasure Hunter keys. Quest points: 355. This entry was posted in How-To Tips & Tricks, Latest OSRS News, OSRS Mobile App, RuneScape 3 and tagged buy runescape account, buy runescape gold, buy runescape powerleveling, rune, runescape 3, sell runescape gold. Bookmark the permalink.